When Hoosier Beer Geek started in 2006, the beer community lacked a voice for the novices. Founder Chris Maples and I knew there were great beers to be had, but we did not know how to begin our craft beer journey. We had great resources in NUVO’s Rita Kohn and IndianaBeer.com’s Bob Ostrander, but we were looking for someone to join in the journey. We put out a call for others to join us in the Knights of the Beer Roundtable. We had some great friends along the way in Jim, Renee, Kelly, Mike, Gina, Matt E., Rod, Jessica, Chris, Matt R., Kristin, Jake, Meg, and many others who opted to travel with us. As part of the journey, we reached out to the brewers and publicans that made a living in beer. We found a community of professionals who were passionate about their work and enjoyed that we at Hoosier Beer Geek were passionate about improving the conversation in Indianapolis. Folks like Deano, Bob Mack, Ted Miller, Clay and Dave, Tracy Robertson, Jon Rangel, Justin-Holly-Jordon-Steve, and many others that let us do silly events because it was fun. We did tailgates, breakfasts, tastings, pairings, and parties that didn’t always make sense but almost always made people happy. We returned the favor by helping the industry with its events. We assisted the Brewers of Indiana Guild launch Winterfest and the Bloomington Craft Beer Festival, and expand the Indiana Microbrewers Festival in Broad Ripple. We brought our own unique skill sets and perspectives to the events and made them better. But at some point, we were dedicating a lot of time to our hobby. And as anybody that is reading this knows, it is an expensive hobby. We had to either scale back our efforts or ramp up and figure out how to get paid. We opted for the latter. Making money from social media and internet content is a tricky business. The most common way for websites to make money is through online advertising and sponsorships, but whenever the Hoosier Beer Geek collective approached the subject, we all felt the same way: selling advertising on the website felt dirty. It felt like we were selling out and bamboozling the public. In online advertising, unique views drives the money. We did not want to let the desire to drive up numbers impact how we wrote. Writing for web clicks is a dirty way to be a journalist, if you can call it that. We did not want to cheapen our writing process. We opted to pursue compensation through two channels: event operations and contract journalism. We convinced the Brewers of Indiana Guild, Sun King, Black Acre, and others to hire us for their beer event management. While I feel that we were successful with everything we did (with one exception that showed me that beer geeks think differently than foodies), we were still a part-time operation. Everybody had their real jobs and family. In spite of the compensation, we were still hobbyists. And while the events grew, we could not. The Guild, at one hundred members, needs someone who can be dedicated to the Guild’s cause. We can’t provide that. They hired an events manager and Hoosier Beer Geek was no longer needed. We also wrote for the Gannett publications for a while. It was great working with Neal and Amanda, but as craft beer became more mainstream, Gannett needed a writer that could address this new mainstream market in the Gannett way. And if you have seen our writings, you know that our writings are not the Gannett way. The opportunities to write dried up as Gannett hired someone to cover the craft beer beat. We sought to improve the craft beer community. You can argue what impact we had, but the community is better now than when we started in 2006. But it outgrew Hoosier Beer Geek by leaps and bounds. There are numerous other voices and organizations that are better able to connect with the mainstream audience. Hoosier Beer Geek has become stubborn in its old age, unwilling to compromise its integrity. And we no longer have the endurance to remain dependable and enthusiastic in the community. We are no longer proclaiming “I’m not dead yet.” We are instead the Norwegian Blue parrot. We are dead. Bleedin’ demised. Passed on. No more. Ceased to be. Expired and gone on to meet our maker. A stiff. Bereft of life, we rest in peace. We are pushing up the daises. This is an ex-beer blog. The Brewpub celebrates its 25th Anniversary on Saturday, November 14th with music from popular local bands The Upright Willies (3 – 5:30pm) and Gypsy Moonshine (7 – 10pm), kid related activities – face painting etc., 25th Anniversary merchandise giveaways, and lots of one of a kind beers brewed especially for the occasion – two in particular to look out for are the Celebration Ale, an English style Barley Wine, which will be bottled, a first for a Broad Ripple Brewpub beer (and a major collector’s item for craft beer enthusiasts) and Last Day Of Camp, an ale that was created using 25lbs of fermentable grains donated by 25 different Indiana breweries – a truly unique endeavor. For newcomers to Indianapolis, it is probably hard to believe there were no brewpubs in Indy 25 years ago and other three breweries in the state. The only local brewery was the now defunct Indianapolis Brewing Company. Broad Ripple Brewpub is the ground zero of the current Indiana brewing scene. English expatriate John Hill opened the brewpub after Indiana statutes were changed to allow on-site consumption and sell distribution. The auto repair shop-turned-English pub was the starting point for other Indiana favorites, such as Lafayette Brewing Company, Brugge Brasserie, and Twenty Tap/Twenty Below. And while many breweries require non-compete agreements, John Hill has been active in building the community. He encouraged Ted Miller to open Brugge just a few blocks from the Brewpub so that he could keep an eye on Ted. And he let Kevin Matalucci open Twenty Tap and the basement nanobrewery Twenty Below while still brewing at the Brewpub. 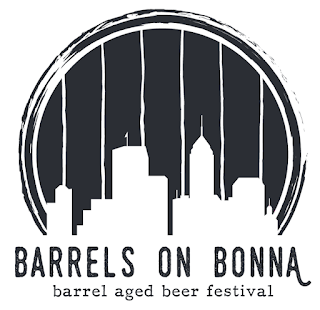 Beyond his own brewery, John launched the Indiana Microbrewers Festival, the original beer festival that operated in the nearby Opti Park and Indianapolis Arts Center until this summer. He has been a champion for craft brewer interests through the creation of the Brewers of Indiana Guild. It is amazing that Broad Ripple Brewpub has endured over 25 years with little change. From beer to food to décor, the Brewpub has remained consistent in quality and resistant to follow the fads. The Brewpub is the soul of the Indiana brewing industry. Every beer fan should pay homage to Broad Ripple Brewpub and its founder John Hill. 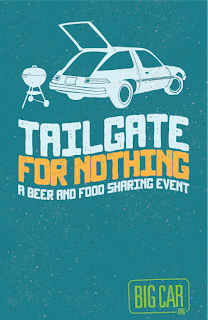 In 2009, the Indianapolis-based website Hoosier Beer Geek held Tailgate for Nothing, a beer and food sharing event. 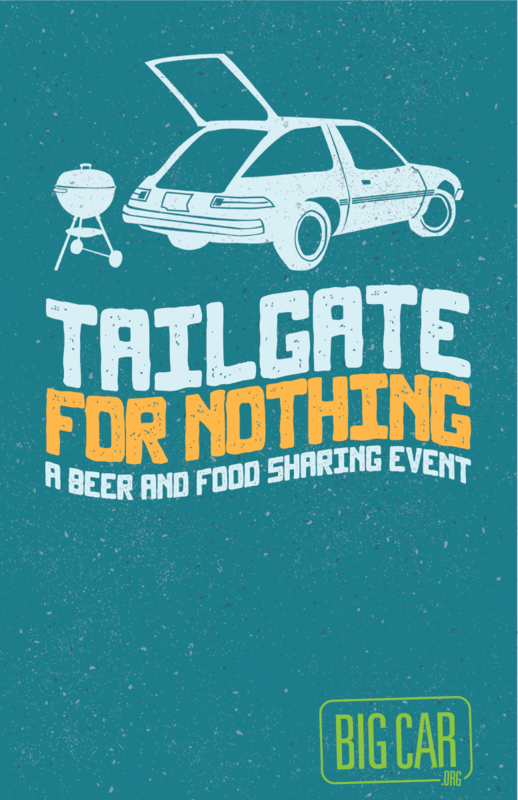 The concept was simple: pick a parking lot, invite friends, and share beer and food. Usually, tailgating is reserved as a precursor to another event. At Tailgate for Nothing, the tailgating is the event. Hoosier Beer Geek has been great friends with the Big Car Collaborative since 2006, and we want to celebrate Big Car's new The Tube Factory. So on Saturday, November 7, 2015 from 11am to 5pm, we will be tailgating in Big Car's parking lot at 1125 Cruft St., Indianapolis near Garfield Park. We are taking donations for Big Car, a 501c3 nonprofit arts organization. The funds will be used to renovate The Tub Factory building. You can reserve your tailgating spot by making an online donation. The minimum donation is $10 per car. You can check out the fun of previous Tailgates at Hoosier Beer Geek. - Weather. We all know that the weather in Indiana is unpredictable. Therefore, regardless of Saturday's weather forecast, we recommend that you bring a canopy if you have one in case the weather decides not to cooperate. Here's hoping that we have sunny skies and decent temperatures. - Victuals. We don't have many rules for this thing, but one rule we expect everyone to follow is this: Please bring beer and food to share. The beer and food don't have to be anything super-rare or of gourmet quality. Just bring something tasty. Don't be a freeloader. - Courtesy. Please pick up your trash before you leave. Our friends at Big Car are doing us a big favor by letting us hold Tailgate for Nothing at their place. Therefore, please return their kindness by not leaving a mess behind. Trash bins will be provided to make the job easier. - I gotta pee. The Tube Factory has functional restrooms. When you go in to return the beer, you can see the progress inside. But stay on the path. We hope that you'll come out and enjoy a day of beer-sharing and food-sharing with us! 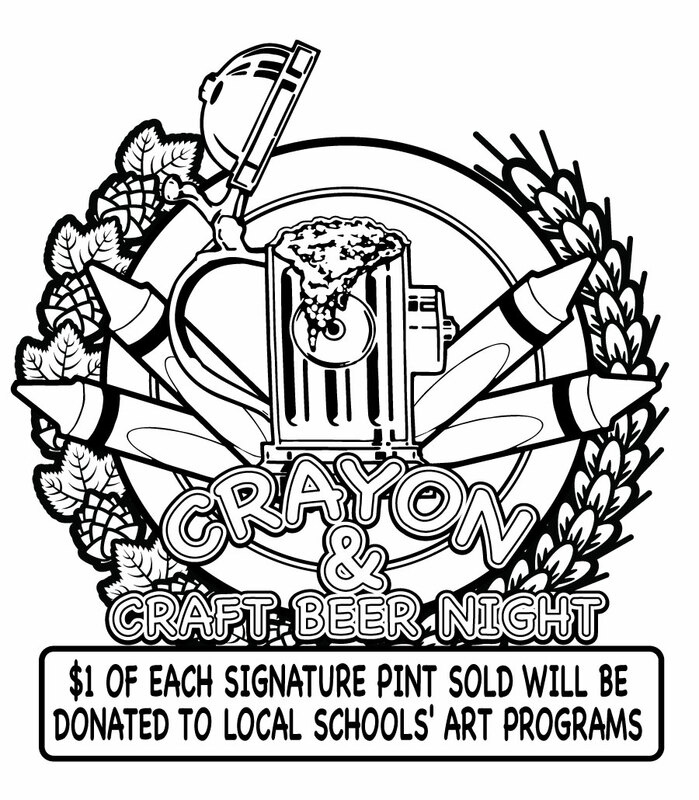 Our friends at Mass Ave Pub are launching a new charitable event called "Crayon and Craft Beer Night." Each month, Mass Ave Pub will select a signature pint and during the event night, they will donate $1 of each pint sold to a local arts program. This month, the Art Club at IPS's CFI School #2 will be the recipient. The beer is Ottermelon, a watermelon gose from Central State Brewing Company. And they have been generous enough to match MAP's donation. 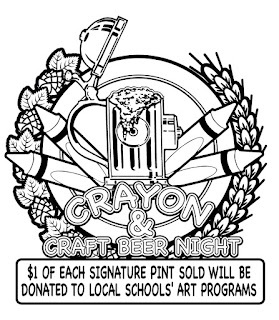 Because Hoosier Beer Geek has a soft spot for CFI School #2 (Jason's kids go to this excellent public magnet school), Hoosier Beer Geek will also match MAP's donation. So count it... that is $1... $2... $3 will go to the Art Club at CFI #2 for every pint of Ottermelon you buy on Tuesday, October 20 starting at 5:30pm. Please come out and think of the children as you drink of the gose. And be ready to color... MAP will have coloring sheets. And yes, we will judge how well you stay in the lines. But for Indy, it is not just another beer festival. 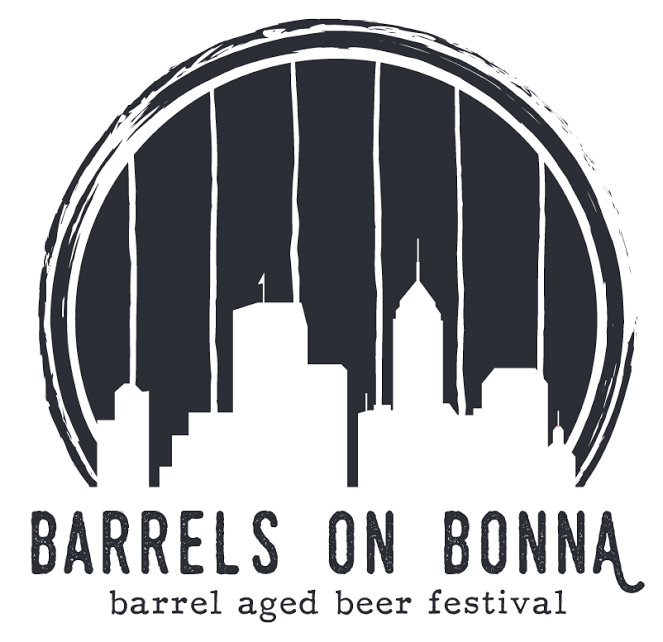 It is a festival dedicated to barrel aged beers. And that excites me. If you know me (and some of you do), you know how much I love beers aged in barrels. Festivals that are dedicated to styles or variations (like Upland's Midwest Sour + Wild + Funk Fest) are a much needed addition to our beer festival scene. And I am happy that Black Acre Brewing is taking it on. Location: Black Acre's production brewery at 5543 Bonna Avenue in the Irvington neighborhood. From time to time, Hoosier Beer Geek is able to offer volunteer opportunities at beer events and festivals. This is one of those times. We only have 20 slots available. -Volunteers must check in at the start of the festival and check out at the end. If you do not have a valid Indiana server's permit, we would greatly appreciate it if you would fill out an application for a temporary permit. 2. Read everything over; ensure you meet the requirements. 3. If you're good to go, fill out the application and hit print! 4. Sun King will pick up the $5.00 fee, so don't worry about that. 5. Get the application sent in! You can drop it off at Sun King, scan and email the application to hbgvolunteers@gmail.com, or mail it: HBG, 266 S. Audubon Rd, Indy, 46219. 6. Please have your application submitted by 8/23. All beer that is leftover from the event will be provided at the Volunteer Party at Sun King (date TBD). If you're found packing up and taking beer with you at the end of the festival, you will be banned from future events. No exceptions. Got it? And the more beer we have for the Volunteer Party, the better! Sign up to volunteer at http://tinyurl.com/canv2015. All follow up communications will come from hbgvolunteers@gmail.com. Beer festivals are a lot of fun, even if you are working it. But make sure that you want to work at the festival and just not enjoy free beer. We work hard together, we drink hard together. We look forward to another great Canvitational! Thank you, and cheers! In One Week! The Finale of the HBG Old Bloggers Tour at La Margarita! Ever since we saw him eating tamalas, we knew that Jim Matt was destined for great things. He spent a lot of time in Indiana, but now he is in Cincinnati brewing some of our favorite beers for Rhinegeist Brewing. 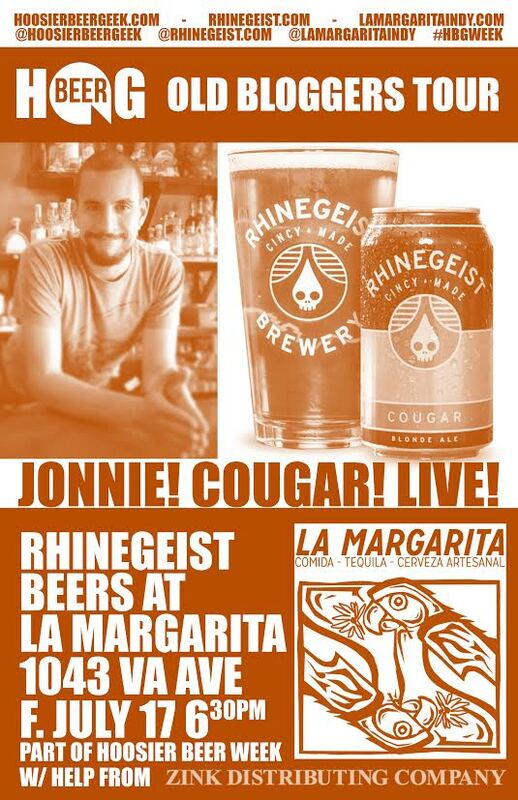 You can't get Rhinegeist beers here (yet) but they will be in town for a beer festival and decided to stop by La Margarita on Friday, July 17th, 6:30pm and do a tap takeover. 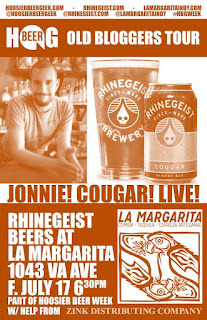 As always, we appreciate Jon Rangel at LaMargarita and his willingness to work with Hoosier Beer Geek. Also, thanks to Eric Fear at Zink Distributing Company for helping to temporarily bring Rhinegeist to Indy. In One Week! Opening Night of the HBG Old Bloggers Tour at Mass Ave Pub! Black Acre Brewing Company: Natural Liberty, an agressively Citra hopped American Pal Lager with plenty of bold citrus hop notes and a light pilsener malt body. 5.3% ABV, 35 IBU. Taxman Brewing Company: Wit-held, an unfiltered brew with Belgian pilsner and German white wheat, finished with hops from Slovenia and the Pacific Northwest; hazy off-white color, light mouthfeel, delicate balance of sweetness and orange spice; crisp, mildly tart finish with a balanced hop bitterness. 5% ABV, 12 IBU. Central State Brewing Company: House Beer variant "Radler", a variation on CSB's rustic blond ale brewed in the style of French and Belgian style table beers; spicy rye notes play with the yeast character from this 100% Brett fermented beer; Blended with Squirt and Orange Fanta. Standard House Beer, 4% ABV, 50 IBU. Mashcraft Brewing Company: Lil Tart, a tart session ale; a delightful combination of barley and wheat with a tart, refreshing finish. 3.5% ABV, 16 IBU. As anyone who has created a popular website (in our mind) knows, it takes a lot of work to keep up and stay relevant. When we first started, there were not a lot of outlets for those that enjoyed micro/craft/local/whatever beers. Years later, everybody is blogging... everybody is tweeting... and our crew was challenged to stay updated on events, new beers, new breweries. Everybody here holds down a job that doesn't involve drinking beers. Okay, a few found jobs that do involve drinking beers. But the long and the short of it is this: we couldn't keep up. So we didn't know what our purpose should be. We have gathered from time to time. We talked about it. And we remembered that we liked to drink with our buddies. And a lot of our drinking buddies came from this website. So that is what we will do: we will drink and we will invite you to join us. GET OFF MY LAWN! 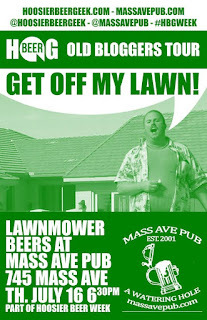 Thursday, July 16th, 6:30pm at Mass Ave Pub. 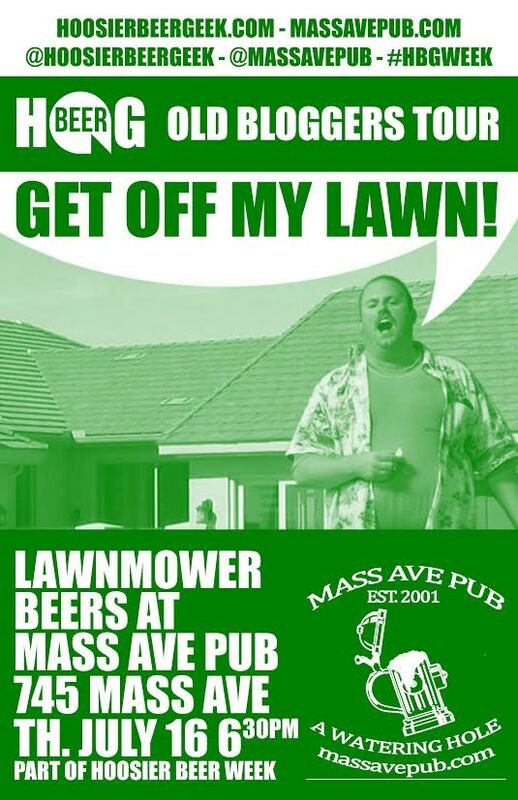 We are pulling together some of our favorite lawnmower/front porch/summertime beers from our Indiana brewing friends and tapping them at Mass Ave Pub. Tracy Robertson is letting us bring in beers from Sun King Brewing, Black Acre Brewing, Outliers Brewing, Taxman Brewing, Mashcraft Brewing, and Central State Brewing. JONNIE! COUGAR! LIVE! Friday, July 17th, 6:30pm at La Margarita. Jim Matt is a favorite former Hoosier; he brews at Rhinegeist. Jon Rangel is a favorite current Hoosier; he runs La Margarita. We will bring the two together for a pre-festival tapping event.